The summertime staple adds a few adorable touches for the holidays. 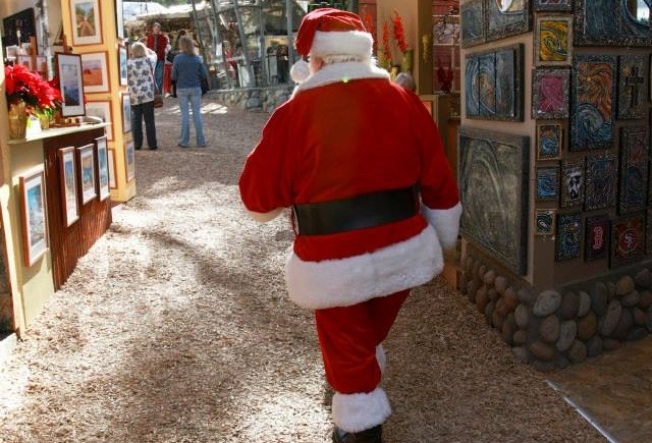 The Sawdust Winter Fantasy, complete with appearances by Mr. Claus, is happening on select dates through Sunday, Dec. 20. MAKING A MARK... on Christmas morning or the first night of Hanukkah or at a friend's December birthday party can be a bit of a challenge, gift-wise. You want your present to stand out a bit, but finding something memorable that will weather the years, and changing tastes, can be an exercise in frustration. There are positive pathways to walk here, including A) grilling your friend about exactly what they want for the holidays (which takes some of the fun out of the gift-giving) or B) finding an object that is handmade and beautiful and brims with California cool and art-tastic vim. If you're not into the whole grilling-over-gift-desires scene -- and not too many people are -- then ponder a morning spent at the Sawdust Winter Fantasy, the seasonal version of the popular summertime art-and-more festival. You're right, this is in Laguna Beach, not too far from the ocean, and you're right again, if you guessed that it is one of the sparkly stalwarts on the Golden State art festival calendar. The Sawdust, after all, has been serving up paintings and photography and jewelry for decades, and its whimsical setting, complete with crunchy sawdust on the ground, lends it that "been around for a long ol' time" feel. It's a feel we crave at the nostalgia-thick holidays, and we also crave a Santa sighting, too, while we shop. THE SAWDUST WINTER FANTASY... can deliver on the Santa front -- he'll be popping by during the festival's run -- and it will deliver on the caroling and cute touches front, too. It shares a lot with its summer cousin, but you're bound to see more quintessential end-of-the-year themes and hues among the gifts and decorations. As for select dates? It all ends on Sunday, Dec. 20, and the open times cluster around the weekends, so give the web site the eye before making for Laguna Beach. As for your friend's gift? You just might find the perfect scarf or weaving or barrette or watercolor, one that represents your pal's personality. We don't always have to grill our loved ones about their holiday desires; sometimes finding something fabulous, and handmade, and meeting the artist in the process, can more than fit the festive bill.